Purification of shellfish is a process that arises for the product to obtain the highest gastronomic and healthy quality. We simulate a natural environment where health and hygiene of seawater and all the purification process conditions are careful. In this way, we care about health systems control and the traceability of all our products. Our facilities are, essentially, facilities for sterilization of seawater. Thereby, we supply bivalve molluscs, keeping environmental characteristics by using a pumping center that provides the required seawater for all the facilities. 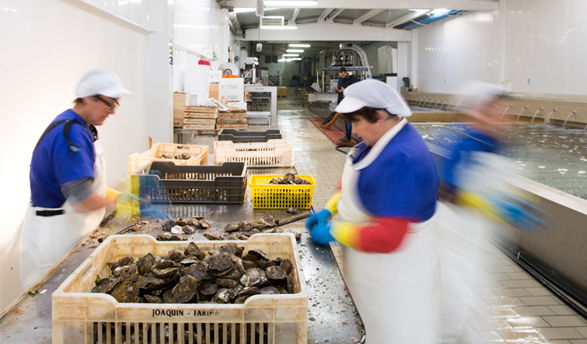 As additional facilities, there is a laboratory of bacteriological control of the shellfish. We have medical technicians working to ensure that our shellfish always comes in optimum sanitary conditions towards the end consumer. Thus, shellfish with our label has a full guarantee of health, being sure to consider it as a quality product.